Vizlib Container is a flexible container extension for Qlik Sense which gives you the ability to better organize your charts and improve the user experience for a more guided analytics experience. Its powerful features and rich collections of customization options (Tabs/Accordion/Carousel/Dropdown) give you all the flexibility you need to create a fantastically user-friendly dashboard for Qlik Sense. Conditional show/hide of charts based on expressions. Selection of pre-set styles to choose from for each container mode, speeding up the customization. Rich customization and formatting options permitting you to achieve nearly every desired design. Activate charts based on certain conditions such as variable values of if certain selections are made. Open Qlik Sense and add the 'Vizlib Container' extension to a sheet. Vizlib Container for Qlik to organize your charts in a more user-friendly way. The Vizlib Container supports an unlimited number of master items which are added from a list of available items to the container object. Each container item will be displayed using its chart name and an icon. You can choose whether you wish to display one of them or both at the same time. By default, the Master Item Chart description is used as the name of the chart, however using the label setting you can overwrite it. You can use Qlik expressions here. By default, the icon is set based on the chart type of the master item. You can override this by choosing a custom icon from the fantastic Font Awesome library. Position the icon at the end or the start the title. Here you can set the ability to hide or show the chart from the list of available charts in the container. The condition can be driven by a Qlik expression (e.g. variable or selection). Activate a chart in the container based on a certain condition which can be a Qlik expression. If more than one charts are activated at the same time, the first one will be displayed. Choose from a list of actions as clearing/selecting filters or setting variables/bookmarks upon selecting the chart in the container. You can add multiple actions which will be executed in sequence. Lets you define which chart in the container will be activated when the page or sheet is loaded for the first time. If an active condition of an individual is triggered, it will supersed the default view setting. The Vizlib Container supports five different modes of container displays to choose from. 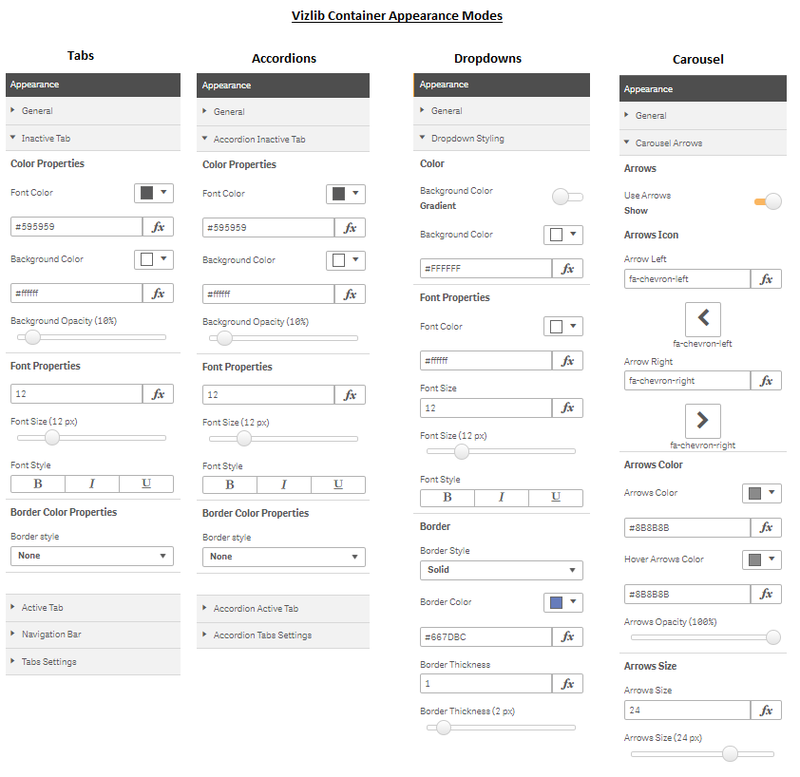 Next to basic configuration settings such as layout and width, you can also choose from a list of pre-set container styles for each mode. Choose from a list of available container modes which display the collection of master item charts in different ways. 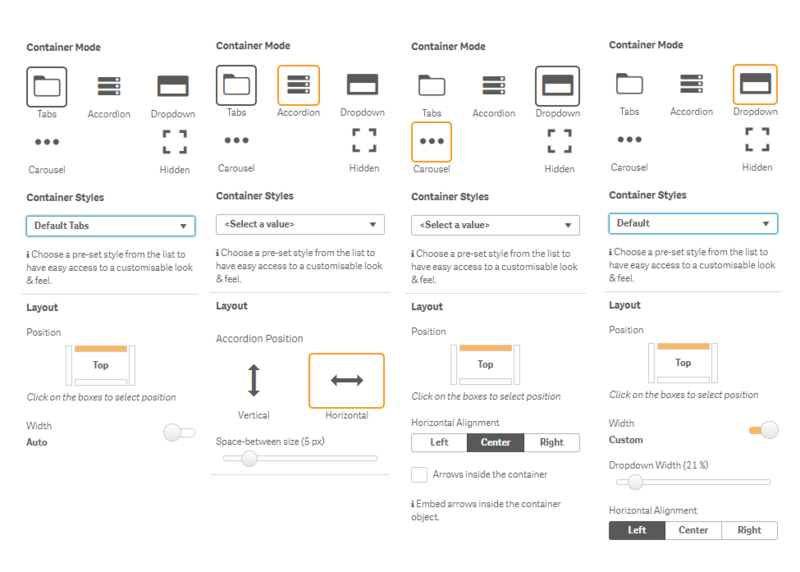 Each container has its own set of pre-set styles which configure the container mode in a specified style. You can then continue modifying the style in the appearance section. Enable and disable the ability for users to maximize objects. Enable and disable the ability for users to take snapshots of this pbject. Issue with selecting filter pane values on active Tab change on IE. Corrected issue with multi select objects when container had an active condition. Implement true show-hide in hidden mode. If no tab is selected (via condition) the container will be hidden/empty. Before the vizlib wizard was shown. The context menu (right-click) on some objects (ie: the native pivot table) was not displayed. When exporting a pivot table a corrupted data message was showing up in some scenarios. When exporting the vizlib pivot table the data was not formatted. Fix rendering issue in mashups. Vizlib Table links won't open when table it's inside a container. In dropdown mode the arrow was not clickable. Fixed missalignment of the icons in Qlik Sense desktop. Conditional show/hide wasn't activating the remaining tab if the condition was fulfilled, a manual click was required to activate that MI. Export data was not working properly in Safari. Vizlib Container does not support native PDF/PPT printing.